Hybrid architectures are growing as companies run more and more applications indistinctly in the cloud and in their own data centers. 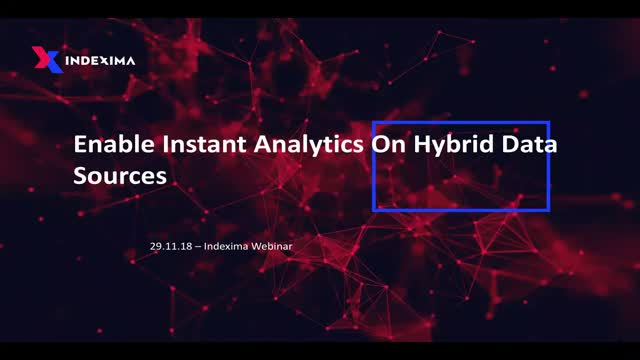 This webinar aims to share best practices for business intelligence and analytics applications with hybrid data sources (cloud and on-premise). 1. Reduce query cost and increase your BI performance. 3. Get more from your existing data cluster. 4. Demo of Indexima on 3 data sources, allowing instant analytics on all business data for all. Every day, your business is producing new data, regardless of how many employees you have or what industry you work in. That data is full of valuable information that can help you better serve your customers, discover new opportunities, and take your business to the next level. But to realize that business value, you need the proper tools to transform that data into actionable insight. 2. Key factors to succeed with BI on the cloud. Conventional BI methodology has become obsolete. It cannot keep pace as businesses demand agility, fast access to data, and fine-tuned analysis. 1. What limitations of existing models have led to a paradigm shift in business data management? 2. How does modern BI work, and what are the advantages for businesses? 3. What are the best practices for getting the most out of BI? As the importance of using data is no longer in any way in question, companies are now facing a major challenge: processing more data, more rapidly and at a lower cost. 2. How could this management be improved on a daily basis? 3. How to solve the equation of instant access to data regardless of their volumes and sources? Every day, your business is producing new data, regardless of how many employees you have or what industry you work in. That data is full of valuable information that can help you better serve your customers, discover new opportunities, and take your business to the next level. 1. Reduce query cost and increase your Business Intelligence performance. 2. Key factors to succeed with Business Intelligence on the cloud. Indexima delivers a powerful solution, allowing instant analytics on all your business data. This robust and scalable solution helps organisations to reveal the powerful insights buried within their data. Indexima queries all your data directly at source, tens of billions of lines handled in only milliseconds. This is Zero time To Data. Whether in the cloud or on-premise the speed of the solution permits real time analysis of your sales, marketing, financial, technical and market research data. Indexima empowers companies to achieve a higher level of performance, to become more agile and responsive as well as gaining a tighter control over IT costs.